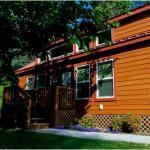 Ideally located in the Sunny Vista area San Diego KOA promises a relaxing and wonderful visit. Featuring a satisfying list of amenities guests will find their stay at the property a comfortable one. Service-minded staff will welcome and guide you at San Diego KOA. Each guestroom is elegantly furnished and equipped with handy amenities. The property offers various recreational opportunities. San Diego KOA combines warm hospitality with a lovely ambiance to make your stay in Chula Vista (CA) unforgettable.